When OSHA releases facts and statistics regarding forklift accidents, they aren’t just referencing the operators of the forklift; forklift-related injuries and fatalities affect all workers in a warehouse. Knowing proper safety protocols and being able to recognize and avoid hazards is a valuable skill not limited to the operators, but is important for all workers on a work-site. Pedestrians inside a warehouse are equally at risk of dangerous situations involving forklifts as the operators. Around 100 fatal accidents occur every year involving forklifts, and about 95,000 people are injured. The two most common causes of accidents are forklift overturns and being struck by a forklift. Out of the 110,000 annual forklift accidents OSHA estimates, almost 80% of them involve a pedestrian. Pedestrians are often injured when they are struck by a forklift, crushed between a forklift and another object, struck by falling objects forklifts collide with, and hit by falling objects from a forklift. The tricky situations inside many warehouse environments, including blind spots, indoor and outdoor use, and narrow aisles, are often conducive to accidents. When pedestrians aren’t trained to understand forklift hazards, they aren’t aware of the stopping capabilities nor of the impaired vision an operator can have. They often try to “beat” an oncoming forklift by thinking they have enough time to cross in front of it. Many accidents involving forklifts occur because the driver has limited vision, since the controls are designed for the driver to face the forks, while seeing through bars, chains, and cables, and sometimes their view can be totally blocked while traveling. When the forklift is backing up, the operator faces challenges to spot every safety hazard because they are simultaneously working the controls while looking backwards. Whenever a forklift is moving too fast, or changing direction, turning, or reversing, all pedestrians need to be very attentive and cautious and they cannot assume the driver can see them or is able to stop in time should they come into their path. Workers on foot need to be aware of the weak spots a forklift operator faces. With forklift safety training, floor workers are able to protect themselves and can even warn operators of oncoming hazards. When workers aren’t told that they need forklift training unless they are operating equipment, this can lead to a working environment that is less concerned over safety issues. 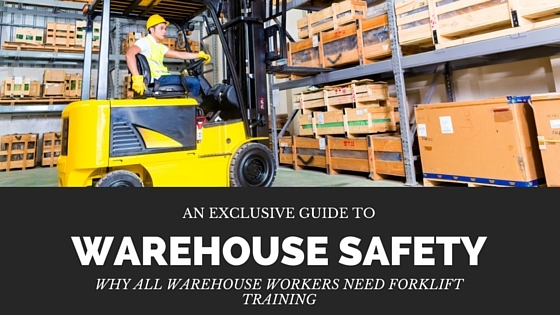 If half of the warehouse involves forklift operators, then only half are informed of the hazards involved with forklifts. Requiring all workers to receive forklift training will help to instill a certain attitude in the workplace that is centered around safety and compliance. If more people on a work site are informed of the risks involved with industrial equipment, less are likely to act in an inappropriate way, or challenge the advice of an operator who does know the potential consequences. If you’re ready to improve the safety and overall attitude of your warehouse employees, then be sure both operators and pedestrians are trained in forklift safety. ForkliftCertification.com offers workers a convenient, one hour, online training program that is 100% compliant with OSHA.